When I was eight years old, my parents wanted to get away from the bombing over London and so moved to near Reading, quite near to the Thames and I used to spend a lot of time there. We had a dinghy and I spent a lot of time at the local lock and got involved more and more as time went on. In the end, when I was a student, the lockkeeper suggested I should be the official summer assistant lockkeeper and after that, I was asked to stay on to do relief for holidays and that got my foot in the door. The following year, in 1967, there was a vacancy for a navigation inspector and I was appointed to that and did ten years then with the Thames Conservancy. I then moved to the Broadland waterways. My predecessor, Charles Collier, was chief inspector and I came first of all as his assistant, or deputy, with a view to taking over when he retired five years later. The Navigation Authority are responsible for ensuring the rivers are in good order for use by the public and, in particular, without interference by other people and that became more important as time went on in the enforcement of the byelaws. One problem we had was with boats going too fast, making too much wash, causing damage one way or another and so enforcement of the speed limits was an important part of the work. A small proportion of the very worst offenders were prosecuted and one advantage of that was it meant, in the case of hire boats, the boatyards concerned realised they ought to take action and they did various things: they would fit a calibrated tachometer, so people knew how fast they were going, and also govern the engines down, so they couldn’t go so fast. The size of the boats was becoming a problem. In my early days there was a lot of concern with one class of boats, which were 12ft 6 wide, and it was felt that nothing could be done as there was a public right of navigation, but in 1971 a much wider class came out, at 14ft. It was such a big jump, I felt something had to be done. We looked into the legal side and we found we could get powers to make byelaws and we did that and brought in the ‘beam restriction byelaws’ to prevent boats over that 12ft 6 from going up all the narrow dykes and rivers. Conservation came under different people like the Nature Conservancy Council, but sometimes we could do things in a sympathetic manner, providing it didn’t cost any extra. I can remember one incident. A River Inspector contacted me; he was concerned because there were kingfishers nesting in the bank where people might moor in front of the nest and keep the birds away from it. So I suggested he put a red danger marker there, so boats wouldn’t moor there for the next few weeks while the nesting was important and I think that worked. That wasn’t strictly our duties, but it didn’t cost anything and didn’t do any harm. I became River Manager I think in 1974. The main parts of the work remained the same; in fact, the change in name was more to reflect what I had been doing than to make any alteration, but the maintenance of the waterways was the main thing and the management of the River Inspectors. Dredging was the important part and the dredging itself is the easy part, but the problem is getting rid of the spoil, or uprisings as they now call it and it was a question of negotiating with different landowners. I remember one occasion: Before making arrangements, I contacted the engineer to the River Authority and asked whether spoil put out on the bank in one particular place would be of benefit. He said it would, but I wouldn’t get permission, because the farm manager was very difficult to deal with. I did deal with this farm manager. I met him; he wasn’t very cooperative at first and he thought he might get money out of us but, in fact, I managed to arrange that we put all the spoil out on his land and he was quite happy about the result. We never paid to tip dredging spoil anywhere. Most of the dredging which was carried out was to counteract silting, but we did carry out one scheme to widen the River Bure for 500 yards near St. Benet’s Abbey; also the channels were widened on Heigham Sound and Sutton Broad. In order to arrange the dredging it was necessary to know where it was needed, and how much, so soundings were taken, very often by a team of River Inspectors in winter. We had to have negotiation with all sorts of other people. In one case, when they wanted to rebuild Wayford Bridge, they wanted to make the road much wider, which would have made the river channel rather like a tunnel and we managed to arrange that they made the channel a bit wider, which was better. Another case like that was Reedham railway bridge. As a result of closing a signalbox at Haddiscoe, they were closing the bridge to shipping half an hour before a train came, which was most unsatisfactory when there was shipping on the River Yare and we managed to negotiate that they put an extra signal in and that stopped that problem. Tree clearance was important too. If nothing was done, the trees would soon be growing out over the river and one problem you have with willow trees growing on the bank is that they start upright, but because the roots are all one side they start leaning before long and fall down across the river. So we tried to make arrangements to clear them before that happened. It’s very much easier and cheaper to clear them when they’re upright than when they’ve fallen into the river. The bridges are the responsibility of either the County Council, or private owners and that sort of thing and other structures is up to the different owners. 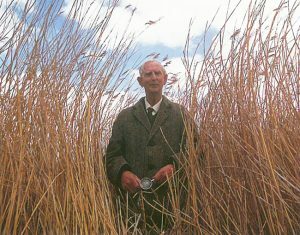 In summer months, in certain areas there was considerable week growth which needed cutting and removing; the Commissioners owned three weed-cutters and also employed contractors with a special elevator to lift weed on Hickling Broad, although in time the need for that diminished. In places it was necessary to mark the channel to keep boats out of shallow water; a mixture of buoys and posts was used and improvements were carried out in various places such as Hickling Broad and St. Benet’s Abbey. The Navigation Authority is not an emergency service, but we would help where we could to give access to places and that sort of thing. We were alerted to the fact that a day launch had gone out earlier that day and hadn’t come back and the wife of the person on board was worried. It was in April, but very cold weather with snow and so I agreed that a River Inspector, or two of them could go together. Fortunately we had a new patrol launch at that time, which was better equipped. When they got up to Hickling they made enquiries and people had seen a boat and it had drifted well out of the channel and it was probably the one, but the trouble was they couldn’t find their way to get to it in the snow storm, but fortunately I knew that we could get help with a helicopter from RAF Coltishall. So I arranged that and the helicopter came out and lit up the passage for them, although they had to come out first of all with a beacon to guide them, but in the end this was successful and the people were rescued. It was a very unusual experience for all of us but, as I said, it was fortunate we had the new launch with a lot of equipment, like a compass, heater and that sort of thing. To begin with, four of the old launches were pre-War and they were, in effect, two berth cabin cruisers dating from the fact the River Inspectors used to just go home for one day off a week and spent five nights a week on the launch. We then got rid of those and replaced them with a type, which had been designed for the Thames Conservancy; fibreglass and about 28ft in length and it was very satisfactory, but modified for single handed manning and with reduced air draught in order to pass under the low bridges. It was quite obvious they were river inspection launches, as they were distinctive; rather like a harbour master’s launch and the inspectors all wore naval-type uniform. One of the biggest changes I’ve seen over the years I’ve worked here is there used to be this commercial shipping on the River Yare going up to Norwich and also tankers to the Cantley sugar beet factory. There were something like 200 a year, so most days there’d be one or two going up or down. Those going to Norwich would carry about 600 tons of cargo, and to Cantley a little more. Well that’s declined, because ships got larger; they now want larger harbours. That’s why at Yarmouth, instead of using the old harbour, they mainly use the new outer harbour and so we’ve lost that shipping. Another thing is the number of hire cruisers, which formed the bulk of the traffic on the rivers; they’ve fallen down considerably. Whereas there were over 2,000, they’re now down to about seven or eight hundred. So they’re down to less than half that they were and that’s the bulk of the traffic. Now go back to 1980, on a typical weekday in summer, passing through Horning there’d be 1,000 motorcraft, as well as other hand-propelled boats, sailing boats and so on, but that’s fallen right away. I think that’s due to a combination of things. Holidays abroad are more attractive; they’re easier to get to and more wives are working now, so they don’t want a self-catering holiday. So that’s how it’s gone. Another change is the length of the main boating season; it used to be from mid-May to mid-September, but now it is late March to late October; this is partly due to the introduction of heaters on boats and to people having more holiday entitlement. A change which we made was in the method of charging tolls on boats; it used to be based on Net Register Tonnage which was unsatisfactory since it favoured boats with large engines and was very complicated and time consuming for the River Inspectors; we changed to a simpler formula of block area (length multiplied by beam). I think my sharpest memories of my working life were when there was a large number of cruisers around, they needed somewhere to moor at night and mealtimes and so on and so we started on a programme of provision of moorings in various places by arrangement. There was also a public house called the Locks Inn, by the lock at Geldeston or, in fact, strictly speaking it’s called Shipmeadow Lock and when the lady who ran it died, the public house came up for sale by auction and I was worried that if it went into the wrong hands, we’d lose the moorings there. It was a very pleasant place out in the country, very very popular for those who found it and so I thought well the answer is we shall have to go to auction and try to buy it. So I persuaded the Committee of the Commissioners we should do that and with a surveyor/estate agent to advise us, we were able to buy it and it was fortunate that we did, because the under-bidder, who’d have got it otherwise was going to use it as a weekend cottage. Having got the land for the moorings, we subsequently sold the pub and it’s continued to run ever since. So we had to make arrangements for moorings in various places. In connection with tree cutting, we had to arrange that with different owners, but the Norfolk Naturalist Trust owned a lot of land by the water and on one occasion I arranged to meet Dr Ted Ellis, who was the Honorary Warden for the Surlingham Broad Estate, and we went round to have a look and we got on very well, in fact, and he was quite agreeable. He realised it was a good thing to cut the trees back and we reached agreement very quickly. People who knew we were doing it were very surprised; they thought we’d be there arguing all day but, as Ted said, if you get two intelligent people together you can usually reach agreement. I think the most interesting and enjoyable aspect of my work on the rivers was making the place suitable for people to enjoy their holidays; I think that’s the thing. You used to get a lot of people, you know, showed real appreciation. Some not so much; they just didn’t appreciate miles and miles of open countryside, but on the whole they did enjoy it. Chris Groves (b. 1934) interviewed for WISEArchive at Barney on 30th November 2016.